Finally, Bangladesh has experienced a win in a breathtaking match. 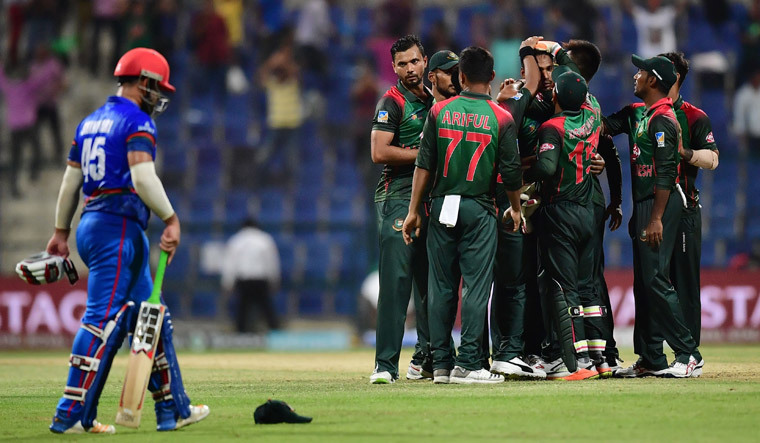 With this remarkable victory over Afghanistan, Bangladesh’s hope of playing the final of the Asia Cup become too strong. All they need to do is beat Pakistan in the last game of Super 4. Although the start of this glorious win against Afghanistan was very poor for Bangladesh. Without Tamim, Bangladesh’s opening pair more likely become a sand dam. Usually, the Bangladeshi spectators wait for its breaks down. At least, they had the experience for the last two matches. In this match, there was no exception either. Bangladesh went to bat first after winning the toss. The opening pair falls apart just in the 6th over while the team total was 17 runs. Newcomer Shanto got caught while trying to hit a maximum of Afghan fast bowler Aftab Alam. Afghani spinner Mujib picked the new number 3 batsman Mithun just after that. Liton Das and Mushfiqur were going well after that early disaster. But later on, Liton got caught while trying an expensive slog-sweep against Rashid Khan. After Liton returned, Shakib and Mushfiqur got run out quite weirdly in the next two overs. Suddenly, Bangladesh becomes 87 for 5 from 81 for 2. In such a situation, the Bangladesh team was preparing to display another batting failure in the Asia Cup. But after that, the game scenario started to change dramatically. Imrul Kayes, actually who just fled to Abu Dhabi, suddenly started play extremely sensible cricket in the sixth wicket pair along with Mahmudullah. Understanding the conditions of the wicket and the game, this pair dealing with single and doubles. In between this, they struck a few boundaries as well. This pair became more spectacular as the game goes on. The Afghan captain and bowlers tried really hard to break the Kayes-Mahmudullah partnership. Interestingly, Rashid Khan able to prove that he has just passed the ‘teenage’ level by showing his anger and frustration on the field while having no breakthrough. However, Mahmudullah was dismissed for 74 in the 47th over. The Kayes-Mahmudullah pair put 128 runs for the sixth wicket. This is the highest sixth-wicket partnership for Bangladesh as well. After Mahmudullah’s departure, Imrul took the total to 249 in 50 overs along with Mashrafe and Mehdy. After playing an extraordinary inning, Imrul was unbeaten on 72 runs. And more importantly, Bangladesh scored 78 runs in the last ten overs. When considering the previous records of the 250+run chase in Abu Dhabi, Bangladesh started to bowl with a positive mentality. Bangladesh took two early wickets in just 26 runs as well. But Afghans would have been in more danger if Mithun didn’t drop Mohammad Shehzad early. Later on, Shehzad-Shahidi pair stood up against Bangladeshi bowlers. Suddenly, Mahmudullah surprised again in the 27th over by picking Shehzad up. Literally, who has looking too dangerous? But Hashmatullah Shahidi brought his team back into the game along with Afghanistan captain Asghar Afghan. After a while, Captain Asghar got out. But on the other side, the left-hander Shahidi, who was in a formidable form, kept the scoreboard ticking. Meanwhile, Afghans needed 81 runs in the last 10 overs with 6 wickets in hand. In this T20 era, it looks pretty achievable. And T20 Specialty Mohammed Nabi was on the crease at that moment. Afghanistan needed 51 runs in the last 5 overs. And in the last over it went to 8 runs. In this situation, the victory of Afghans was inevitable. But while the bowler’s name is Mustafizur Rahman, Bangladesh could expect something amazing. And ‘The Fizz’ did it so. He gave away only 4 runs in the last over and brought an incredible 3 runs to win for his team. Afghans fought really well throughout the innings, but have to face the defeat in the last delivery of the match. Bangladesh’s victory in this match ensures Afghanistan departure before the final of the Asia Cup. However, whoever wins in such a match, the real victory is going to the game of Cricket.